Sunday nights, 8:00 PM on the 146.58 Simplex frequency. Check-ins taken as early at 7:30 PM. You definitely need to be checking in to the Central Alabama Simplex Net. Here’s a quick rundown, with new ham operators particularly in mind. As you know, you got your repeaters, on which most of the area nets happen. That’s a great thing. However, a major disaster could knock out some or even most (or even all) repeaters, at least temporarily. So, then, as you know, in the ham radio world we would be left with simplex: direct radio-to-radio contacts. 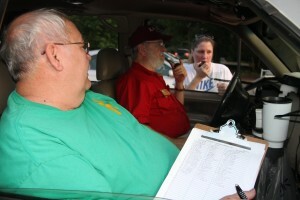 Given the value of ham radio in the aftermath of disasters, this is important. So, enter the Central Alabama Simplex Net. Central Alabama Simplex NET starts at 8:00pm every Sunday on 146.580. A couple of guys (more about them later), drive up to a high elevation in Birmingham–the parking lot of the Tip Top Grille in Bluff Park, usually–put up an antenna, and serve as the primary net control station. There are lots of other nets on Sunday evenings, and so the net control folks take early check-ins starting as early as 7:30pm for those that have other nets at 8:00pm and 8:30pm in which they participate. In addition to the station “on the mountain,” a team of other operators, notably with particularly impressive systems and directional antennas on towers, assist by pointing their antennas around the compass, calling for check-ins. Check-ins come from as far away as Arkansas, Tennessee, and Georgia, by the way. In addition, folks are encouraged to listen out for operators THEY can hear, even if net control can’t, and relay them in. So, you listen up and, if you’ve got a directional thing happening, point to Birmingham. You’ll hear a call for check-ins based on your compass direction relative to B’ham. Check in and relay in anyone else that you can hear on the frequency. Be patient, though. There’s a good chance that you will be able to hear net control, but NOT be able to hear many/most of the stations that check in. So, that makes it inevitable that there’s lots of doubling. Just keep trying. A special shout out to the heroic and dedicated net control team. Deryl (WD4IGK), and silent key Glenn (KA4SZQ) and a considerably more attractive assistant, Ashley. In memory of Silent Key, Glenn Raines, KA4SZQ, who died in November, 2015. Glenn’s passing at home was discovered when he failed to show up for the Central Alabama Simplex Net. He will be greatly missed. We will be on the air at 7:45 central time from My Leconte in Tennessee. Sunday for the simplex net. Back packing up batteries and radios. If bad rain we may not activate.